The middle cottage had suffered a fire in the previous decade involving, I believe, a fatality. By the time they were demolished in 1961 they had been allowed to become quite derelict and the Benfleet Urban District Council was persuaded that the rapidly expanding village needed more shops. In those days it seems there was no inspiration to preserve heritage buildings. Would it be much different nowadays? I’m not at all sure it would: old buildings need to have some purpose other than mere aesthetic appeal, if they are to survive. Nevertheless, half a century later, it seems shameful (to many besides me) that so picturesque a scene was “wantonly” destroyed. I carefully reconstructed the painting from a number of old sepia-coloured postcards and can vouch that it is quite authentic – only the figures, geese and wagon were added. I have an (as yet) unsubstantiated theory that these “Hart Cottages” as they became known had once been the original watering hole for the village, and (according to Chapman & Andre’s famous map) was known as The Horseshoes. My reasoning is that the White Hart Inn is not nearly so old as these cottages and their location alongside Dark Lane was strategically optimal, on the straightest line between Daws Heath and St Peter’s Church. Church Road used to extend to this exact point, so this was the meeting point of three main tracks and, should further circumstantial evidence be needed, a spring fed a public pond right opposite – and so wagon-wheels could be soaked and horses watered and cooled, whilst the carters slaked their parched throats in The Horseshoes. 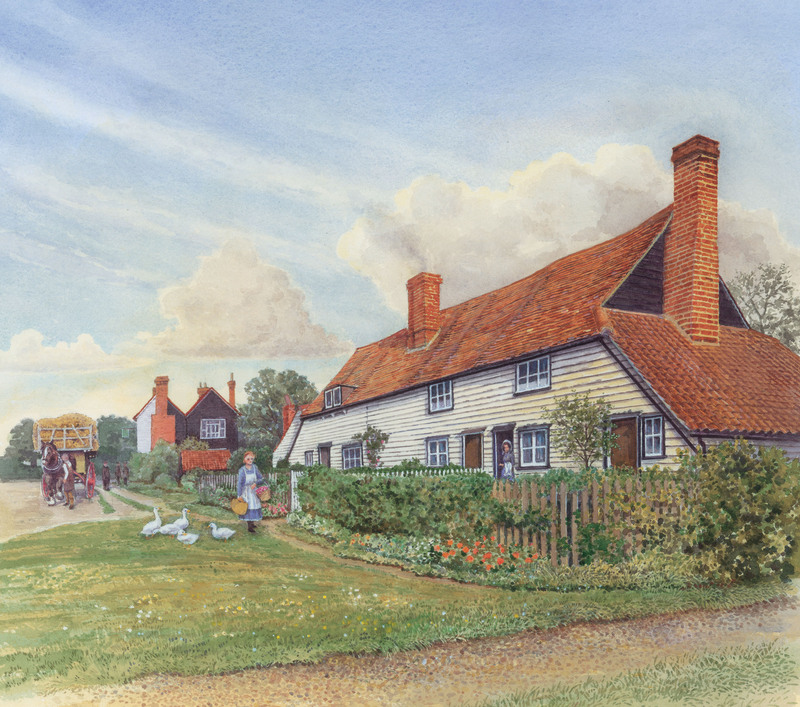 I cannot help thinking that if Hart Cottages had been preserved Thundersley would be a very different place today. But… hindsight is a wonderful thing! Perhaps, in a sense, Thundersley has been a victim of its own success? Luckily, we have Robert Hallmann’s excellent book to remind us of our heritage. Thank you, Robert. I remember these cottages well as we lived opposite the White Hart (no. 85) and of course I attended Thundersley County Primary School, wearing a grey and yellow uniform. There was indeed a fatality caused by a fire in the cottage. I am sure that I also remember the pond opposite but feel that it may have been filled in quite early as I don’t remember it during my actual school days. Was This The Original Jarvis Hall? What used to be here?